via the Nalanda-Sriwijaya Centre, a newly-published report on the excavations at the Victoria Concert Hall in Singapore. 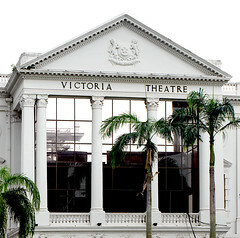 In September 2010, the Victoria Concert Hall and Victoria Theatre were closed for major redevelopment amounting to the sum of $158,000,000. The construction project saw extensive demolition works and the compound within was impacted. An archaeological evaluation conducted in July 2010 revealed pockets of cultural deposits from both the colonial and pre-modern eras. This discovery of an in-situ archaeological reservoir led to a three-week large-scale rescue excavation in September 2011. While the excavations were restricted to only a small area of the construction impact zone, the archaeology team successfully recovered approximately 654 kg of artifacts and ecofacts. This preliminary site report details the excavation sequences conducted at the site. Lim Chen Sien from the National University of Singapore will present the findings from recent excavations at Singapore’s Victoria Theatre and Concert Hall.